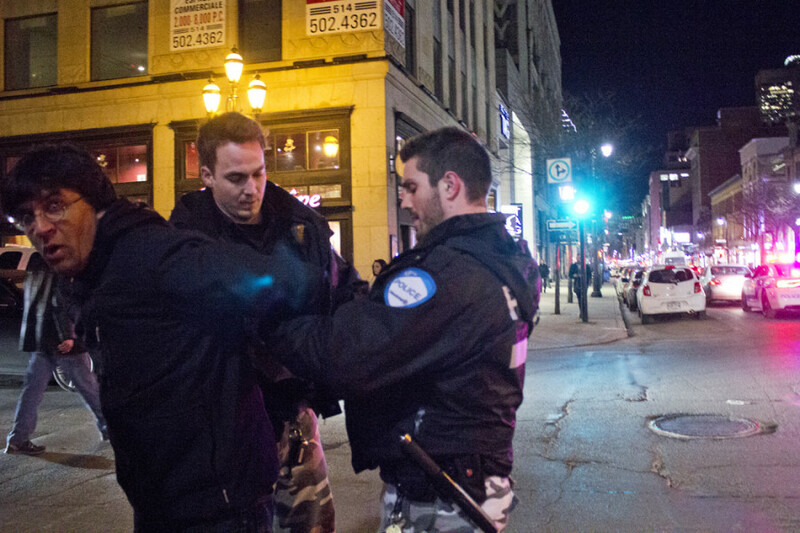 On March 21, Montreal activist Jaggi Singh was arrested on the corner of Crescent and Ste. Catherine St. at 9:15 p.m. He was fined $440 for being in violation of a by-law concerning noise and $148 for refusing to cooperate with the police. 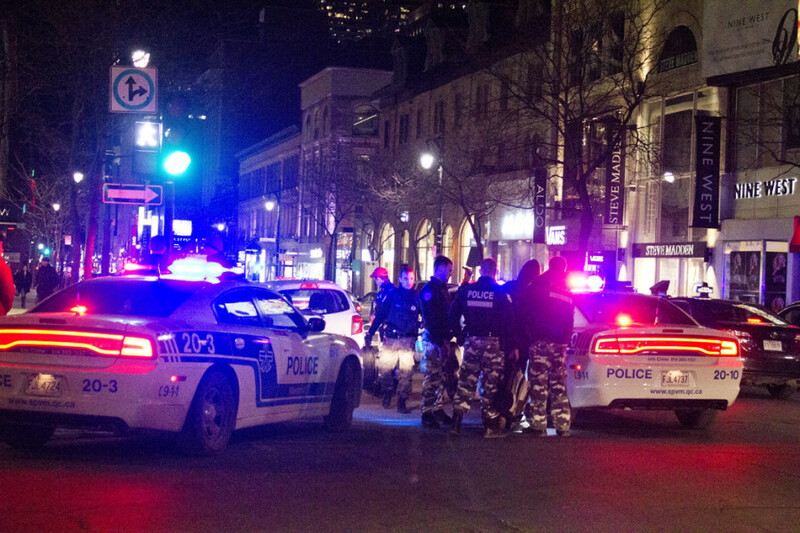 He was brought to SPVM station 20, which is also on Ste. 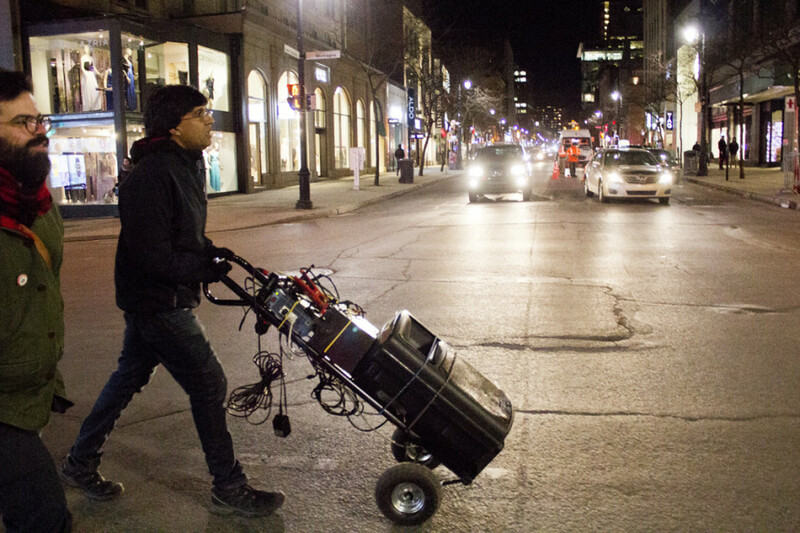 Catherine St.
Singh was walking away from the Marine Le Pen “Welcoming Committee” demonstration that he organized while playing music from a speaker attached to a trolley. The activist was accompanied by two friends who were at the protest in front of the Montreal Château Marriott, two Link journalists and live-streamer Jade Sambrook. Singh crossed Crescent St. when one of two police officers parked on Ste. Catherine St. asked him to stop. When Singh refused, the second police officer, Gabriel L’Heureux, with the badge number 6989, ran and crossed Crescent to stop Singh. A third police vehicle arrived quickly on the scene, and was followed by two others. The six police officers on the scene closed off the corner, then asked that bystanders cross the street and move away from the scene of the arrest. Earlier that evening, the demonstration Singh organized took place in front of the Marriott hotel on the corner of Peel St. and Place du Canada. The leader of France’s controversial Front National, Marine Le Pen, was rumoured to be staying at the hotel. Le Pen was to attend a cocktail hour planned for 6:00 p.m., but it was cancelled, according to hotel staff. The hotel also closed the metro entrance inside that would allow anyone from entering the building from underground. Le Pen is in Quebec for a six-day visit. She was in Quebec City on Sunday to give a speech to celebrate International Francophonie Day. Numerous Quebec politicians have refused to meet Le Pen, such as Parti Québécois leader Pierre-Karl Péladeau and Quebec City mayor Régis Labeaume. Protesters arrived at around 7:45 p.m. The situation was calm, but by 8 p.m., when Singh showed up, around 100 protesters had gathered. A small fence separated the demonstrators from the SPVM, who were down the steps from the hotel across from the hotel’s roundabout. Singh brought his trolley on the roundabout and was confronted by three police officers. From that point on, the number of SPVM protecting the hotel’s entrance increased. “I’m here for a dance party,” Singh said, speaking in the microphone attached to a loudspeaker. Forty-seven-year old Sandra Cordero was at both protests this week: the anti-police protest on March 15 and the demonstration on March 21. Cordero didn’t understand why the government didn’t try to stop Le Pen’s visit, and was disappointed that Quebec Premier Philippe Couillard didn’t denounce the assault by one of Le Pen’s guards in Quebec City on Sunday. According to the Canadian Press, Le Pen’s guard punched a protester twice during a demonstration. The altercation was caught on tape. Festive songs were played, like “Ouvrir les frontières” by reggae singer Tiken Jah Fakoly. The latter was picked up by a five-piece marching band who stormed in and joined the group. “Put something in French for Le Pen!” shouted a protester. Throughout the night, rumours spread that Le Pen may have been at the Station des sports restaurant on Ste. Catherine St. When The Link called the restaurant, the manager didn’t confirm her presence but footage from TVA shows Le Pen leaving the establishment. According to protester Gregoire Beaune, who was at both the Marriott and Station des sports demonstrations, two people—possibly more—were arrested outside the restaurant. When protesters began to leave at 8:45 p.m., some headed for the Station des sports. “It was a success,” Singh declared on the microphone. He was arrested 15 minutes later, on his way to the QPIRG office.